As someone who makes her living (partially) from running social media feeds, I am a fan of any tool that makes that job easier. I use a variety of different apps and tools to generate and schedule content to Facebook, Twitter, LinkedIn and Instagram (I’ve given up on Google + finally). I have long been a fan of Hootsuite, and use it daily to schedule tweets and to plan out my Instagram posts for the week. A long time ago, though, I gave up using it to post to Facebook, and that’s because of Facebook’s algorithm. 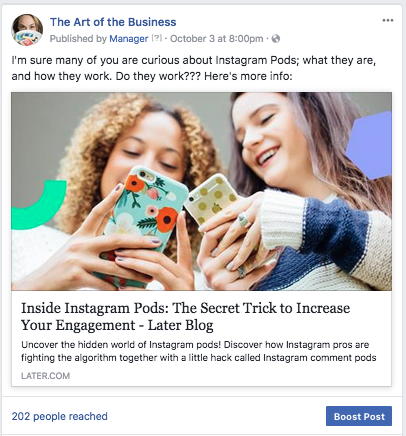 I ran a series of experiments, using Hootsuite, and then, later, Buffer, to test my theory that using a third party app would make a difference in the reach of your posts. I felt like while I used a third party app like Hootsuite or Buffer to schedule my Facebook posts, my reach was less, so I decided to test that theory. You can read those posts here and here, but I’ll give you the reader’s digest condensed version. In both of my experiments, using a third-party app to post to Facebook meant less reach than using the Facebook scheduling tool. I recently started using a new social media tool called Agorapulse that I like lots, because it does different things than Hootsuite, like queuing the same tweet over and over again multiple times. And yes, I have been using it for a few weeks to schedule posts to my Facebook page and to my LinkedIn. So I was curious: had FB’s algorithm changed since the last time I did this experiment? Or would Agorapulse for whatever reason be immune? I did two weeks of posts: one scheduled through Agorapulse, and one scheduled through the FB publisher. I compared 13 posts that were scheduled through Facebook and 13 scheduled through Agorapulse. So, yes, again it looks as if using a third party app does indeed impact your reach on Facebook. However! Someone even nerdier than I did a similar experience, and you can read about how that turned out here. What are your thoughts? Do you find your Facebook posts get less reach when you use a third-party app? Let me know in the comments below! I think when it comes to testing the reach/engagement of 3rd party vs native posting, the answer is always going to be: “It depends.” There are just too many variables to do a true controlled experiment. Not to mention that each industry/audience/content is entirely different. I think the only person who could really solve this would be Dr. Sheldon Cooper. Normally I live by the numbers, but against my better judgement I have gone with the mob mentality that keeps telling me that auto-posting from 3rd party apps tanks the numbers. I never really bothered to get to deep into it or test it myself. I just trusted the herd. Like many things in life, there is a cost for convenience.